It is with sadness and regret that The Parish of Our Lady and St. Dympna’s Catholic Women’s League has closed after 44 years of service to the Parish and Archdiocese. Throughout these years many women have served the Parish and wider environs, being a voice for the marginalised, and praying and raising awareness of important issues. at 10a.m. Wednesday 10th October. Thank you to each one who has supported the Catholic Women’s League over these years. Thank you for all the Parishioners who have supported the Catholic Women’s League through this time”. On the 10th September 1927 the inaugural meeting of the Catholic Daughters of Australia was held. The aim of the women who started the Association were to provide for the spiritual, mental, physical and social welfare, by whatever means deemed advisable, of women and children. 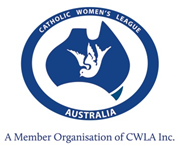 The group continued operation under this name until 1974 when it was changed to Catholic Women's League (CWL) to be in line with the other states. In 1984 a branch of the Catholic Women's league was founded in Aspley, the same branch that still exists today. Father Gerry McSweeney and Father Bill McCarthy sat at the first meeting and Marj Williams was the first President. Present members of the CWL play an active role in the Parish - St. Vincent de Paul, Aspleycare, Walking with Love, Church Organists and singers, the Pastoral Council, Extraordinary Ministers, the Liturgy Group, St. Monica’s Guild, and the Family groups, and the Cathedral Welcomers/Guides, to name a few. We also visit the other Branches in the Archdiocese when they hold their Annual General Meetings and have Social Days to various places. As a National body we address social justice and ethical questions and seek to influence legislative and administrative bodies at all levels in order to preserve the dignity of the human person. Internationally, we work together with over 5 million women in more than 60 countries to promote the presence, participation and co-responsibility of Catholic women in society. Catholic Women's League Aspley Closed October 2018. 1984 - 2018 CWL Aspley.